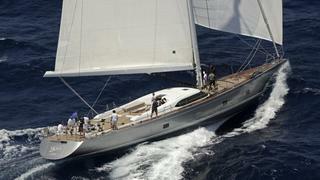 Elena Canepa at Pegaso gets in touch to say there's been another drop in the price of the 30.2m sailing yacht Fado. Delivered by Southern Wind in 2007, she’s the fourth yacht in their popular SWS 100 series. Farr Yacht Design was responsible for her hull lines and sail plan while Nauta Design worked on the general concept, interior and exterior styling. The interior layout is classic Southern Wind, with crew quarters aft and accommodation forward in an owner’s suite and two twin guest cabins. At anchor during the Monaco show and also exhibiting at the Genoa show, Fado is now down from €6.95 million to €6.5 million.